SoftStepper is a Ableton Live Remote script which monitores states of loopers. 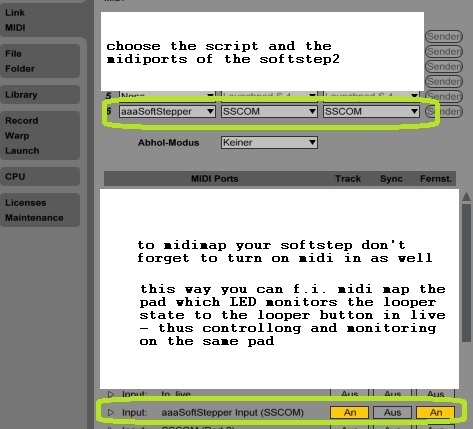 It doesn't actually receive any midi from the Softstep2 itself, it just reacts on changes of loopers in Ableton Live liveset and sends midi to the softstep in order to update its LEDs. The script checks the names of looper devices dynamically in the current liveset and when a looper with a name (default) 'ssl1' - 'ssl10' is found, the respective pad's LED will monitor loooper states. Thus max. 10 loopers can be monitored max. there is o custom setup of the Softstep necessery. For instance: If one drops a looper on a track and hits 'ctrl + r' to rename the device and enters 'ssl3' the third pad of the Softstep will monitor the states of this looper. If one wants to control the states then the usual midi mapping functionality of live should be used. I had some problems to control the looper with the scripting to a satisfactory degree, so I decided to use the usual midimapping for this. 1. download the remotescript by clicking here lefthand on the navigation on 'Download' (next to the small cloud-icon). In the following screen click on 'download repository'. The resulting file will be something like 'drival-softstepper-e4f632bcb420.zip'. -> Unzip the folder -> rename the folder because Live doesnt like dashes in remotescript names call the folder softstepper and put the resulting folder in Live s MIDI Remote Scripts directory. After scanning all tracks live recognizes the looper with name 'ssl1'and you should see that pad number 0 starts to be solid green? When you now click on the multipurpose button of the looper you'd see the LED changing states accordingly. # and a name. The name will be looked up by this scriot for all loopers put into the set.